Sarah Armstrong lives in Essex with her husband and four children. 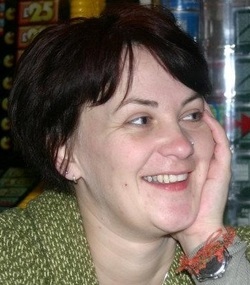 Her short stories have been published in Mslexia and Litro, and she teaches creative writing for the Open University. 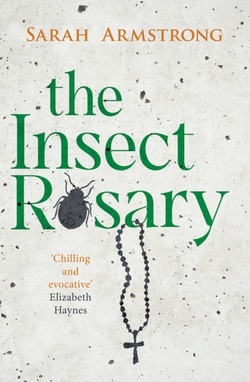 Her debut novel, The Insect Rosary, is being launched at Red Lion Books in Colchester. Congratulations on the pending publication of your debut novel. How does it feel as the big day approaches? Has anything surprised you about early readers’ reactions to the novel? Not yet, although I’m surprised that my Mum has been so forgiving! It is her family home that I use as the setting for the novel and she’s been very good about me turning it into a place where bad things happen. The Insect Rosary is set on a remote farm in Northern Ireland, with one strand in the present and another at the height of The Troubles. What difficulties did you experience in bringing that period of secrets and menace to light? I had the experience of being on holiday at my granny’s farm in Northern Ireland during the 70s and 80s to draw on. Like the children in the novel, in the early years had an incomplete awareness of the reasons between the sides and complications. However, it was difficult to tie what was in the news to my experience of the place which was my other home, with more sheep. To put it in context for the novel I read factual books which looked back at the period and the politics, and these helped to remind me of the feeling that something wasn’t quite right. The problem was drawing the wider political situation into the domestic space. I wondered about Eithne, the children’s mother, not recognising the danger and abandoning the holiday for home. Of course, there’d have been less of a story if she had done, but I wondered if you were also making a point about her idealisation of the rural life (in a similar way to her daughter Nancy’s and much of the Irish diaspora)? For me Eithne is so accustomed to shutting things out that she cannot really accept that there is any danger past the individual figure of Tommy. I saw her as a mother of three children who, faced with the summer holidays, goes home so that it isn’t just her and the children banging around the house for six weeks. She goes where she is comfortable and has company. I think the pull of family and familiarity is greater than any threat she can see. I liked how you drew parallels between Bernie’s childhood experience of having her truth suppressed and the behavioural difficulties of Nancy’s fourteen-year-old son. I wondered if you’d considered showing more of Bernie’s unhelpful involvement in mental health services in earlier drafts? I did, yes, but it grew to be a distraction in the novel rather than something which was relevant to this story. What came to be more important was the way a child’s silence is encouraged in different ways, to stop them saying the ‘wrong’ things or behaving ‘badly’. The words burst from Bernadette and Hurley cannot seem to articulate his experiences. Silence is dangerous in this book, and the silencing of children most of all. How did you come to the structure of your novel: short chapters set in 1982 narrated in the first-person from Bernadette’s point of view alternating with the contemporary strand related in the third-person from Nancy’s perspective? I didn’t want the novel to be just about The Troubles, but about the way we all act having repercussions. Siblings are of great interest to me – I am one of four children and I have four children, and I can see the same patterns being repeated, alliances drawn and broken. Nancy does something truly terrible to Bernadette, but siblings do things all the time which could be terrible which (by luck or chance) we come to laugh at. Using an adult perspective allowed me to think about how we come to accept our actions and try to gain redemption. The child’s perspective helped me to remember how easily children can be manipulated through their inability to understand the implications of what they do. Using the two sisters also allowed me to play with the reader’s sympathy. Writers are often beset with a range of different creative ideas. How did you know that The Insect Rosary was the one you wanted to run with? I didn’t mean to! I had almost finished the first draft of another novel but I really wanted to give NaNoWriMo another go, so shelved that one and saw how far I could get with The Insect Rosary. I made it to 35,000 words in that month and was gripped. The pressure of the time and word limit had made it feel much more real to me than a normal first draft and I knew the shape was right. Writing from the two perspectives also helped as when I got stuck I could switch and the problem had resolved itself by the time I came back to it. I had to accept that my novels were problematic for agents – in previous novels my women were murderous, scheming and ambivalent to motherhood (at best). While this didn’t put me off trying to get an agent it did make me think of applying directly to publishers, and this is where smaller publishers really come into their own. It feels that they are more open to ideas and if they spot something they like in a novel they can give it a go. This is something I’m hearing more and more from writers. I read about Sandstone Press in an article in Mslexia on women in publishing and they have been fantastic. As a lecturer in Creative Writing with the Open University, what’s the main piece of advice you want your students to take away? Think about wider outside influences on your characters – see them as part of the world, not just their immediate situation. And what commonly-touted writing advice should they ignore? I think it all has at least a grain of truth. I would amend ‘write what you know’ to ‘write what you know but make it much more interesting’! It’s about a woman who is under attack from her loveless husband, her disaffected daughter and possibly the devil as well. All she knows for certain is that one of her daughters is dead, the other is missing and her husband knows more than he’s saying. And she has a shaman living in her shed. Name one book you'd love to have written. The Song of Achilles by Madeline Miller. One of those ‘well, I must as well give up now’ books. Are any of the characters real? Yes, Bruce!